A screenshot of my character sheet in Tiny Adventures. Credit: Wizards of the Coast. 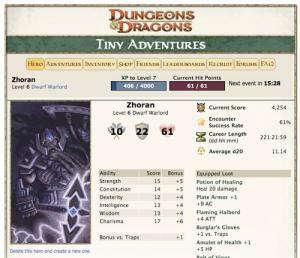 Dungeons & Dragons: Tiny Adventures is that rarest of WotC digital products: one that actually delivers. Wizards of the Coast’s litany of digital failure is long. D&D Master Tools. D&D eTools. D&D Insider. Gleemax. All overhyped, and under delivered. Yet here’s Tiny Adventures for Facebook, a simple but surprisingly addictive little app that no one saw coming. The app embraces D&D 4th Edition’s “Points of Light” philosophy. You create an avatar based on one of the core 4th edition classes, such as fighter, cleric, warlord, etc. Your options are limited to certain race/class combinations (e.g. dwarven warlord) and stats are pre-rolled. Once you make your pick, you head out into the vast wilderness to combat threats including royal usurpers, scheming witches, and goblin raiders. Each quest is essentially a 4E-style skill challenge. It’s broken up into 9-12 stages, each of which involves some sort of maneuver to defeat. Sometimes its a Dexterity check to sneak past some guards, other times it’s a Constitution check to shake off the effects of poisoned food, still others its an Armor Class check to avoid a hit. Encounters yield gold, weapons, armor, potions and other pieces of equipment that you can equip or sell for gold. Gold can be used to buy new, better equipment. The game incorporates a limited social aspect; you can heal and provide skill buffs to Facebook friends who playing the game. Unfortunately it doesn’t allow you to trade magical items or gold, and you can’t adventure together as a party. The app also had some serious uptime issues when it was first launched (and proved surprisingly popular with the Facebook crowd) but those have since been resolved, and the game now runs smoothly. If you come into the game looking for a highly customizable character, group adventuring, or puzzle-solving, you’re going to be disappointed. But if you’re looking for a momentary fantastical diversion, you’ll find this app doesn’t disappoint. Next Post:Is this the Golden Age of Scifi RPGs?